Getting an AdSense approval is one big task for all the bloggers and keeping an AdSense account for long terms is another big deal to all of us. So, by analyzing immense number of accounts with issues I have few strong reasons for Google AdSense account ban. If you click on the ads that are places in your own site, then it’s done with AdSense. Definitely it leads to ban of AdSense account. Never click on your own ads. Use Ad-Block for your site especially when you are editing nor reviewing your site. Make sure with this. 1 or 2 times AdSense will give you a chance and sometimes it may not happen. So, better be careful with this. This is the silly thing that is done by each and every blogger in their starting stage or still. If you encourage your friends to click ads on your sites then that will be a big harm to you. Because there is also a few strategies for Google. Google can identify either the clicks are genuine or fake. May be for few times you may not get banned, but if you continue to do this, then your payment may stop at any time. So, be careful with this. If you want genuine clicks on your ads, then suggest your site for your friends to read content and if they really want to know about any Ad then they will click on your ads. Instead of saying to click on ads, suggest good articles related to new technology, which are more interested. In this way you can get traffic, Ad clicks and make audience to get addicted to your site. Never place ads in websites containing illegal products, Adult containing and mainly in Live streaming. In such cases there may be AdSense ban or Domain ban. So, be careful with these things and if you want to give a try then that is up to you. To my and my friends experience we have faced such things more. Not placing ads in such blogs is the best thing for this. There are some bots and automatic machines where some black hat people use for making automatic clicks by setting a time. So, never go greedy for money and do such things. Never use bots for AdSense clicks. There are many White hat things to get AdSense clicks like High traffic, Popularity, etc. Never degrade yourself. Placing Ads in wrong places, overlapping of menu bar and Ads, and many more. So, avoid wrong monetization of Ads. Do perfect monetization for more clicks and results in good income. Learn about the Ads placement and place in correct places which suits to your website. Developers are creating tools and embedding ads in that particular applications. So, whenever a user use that tool, they embedded the script like the click is done on the Ad. This will definitely leads to ban. Never use such tools or applications in your site. Creating a scripts and embedding into sites. Clearly it mean that, whenever a user comes to the site and where ever an user clicks on the site, the click is done on the AdSense Ads. In this way the script is designed and used by many of the blogs. Don’t use such scripts in your sites. Webmaster Guidelines is broken up into three parts: design and content, technical, and quality. Following these best practices will not only help Google find, index, and rank your site, but these guidelines will also serve to expand your business and attract more visitors by creating sites with unique and valuable content. Encouraging invalid clicks, that is, misleading labels, misleading to click, unnatural attention, deceptive layout: Publishers are not permitted to encourage users to click on Google ads in any way. This includes implementing the ads in a way that they might be mistaken for other website content, such as menu, navigation, or download links. These are the main reasons and common reasons for the Google AdSense Ban. 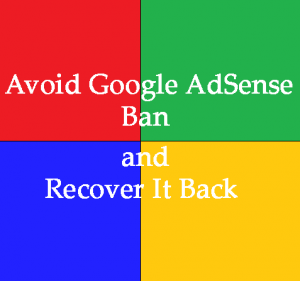 If you face any difficulty in Google AdSense Account Ban or verification or any other issues related to AdSense. Then let me know in your comments and I will get back to you with a solution. This is a very good post on Adsence ban, but currently im running a world cup blog, which shows even live streaming, so cant i apply for adsence ??. Need your reply or any alternative way to get safe from banned. Before applying for AdSense better remove live streaming and then submit for the AdSense. But, if you use AdSense in live streaming blogs then definitely it will get banned. Thank you for your quick reply. Just adding to that, does having live streaming keywords within the posts results in ban, or showing live streaming only happens to ban? The word Live Streaming is not an issue for Google AdSense ban. But, the copyrights matters here. So, people who ever have copyrights they can keep Live streaming and can use AdSense in their websites. But, if you don’t have copyrights just be careful with this issue. If must you want to use that, then just insert the words and don’t give any link for the live streaming. can I share my site to facebook ? Thank you for the great tips. In the beginning, I also made some mistakes but learnt a lot later. Thanks for reading the article. Still there are few things where we have to be very careful to protect our AdSense account. I will include those points in the next update. Mam, How to earn money online without website or blog. Please write those reviews also. Hey alltop9 my website is based on event blogging and its contain only one page greeting card and all traffic on this blog are form whatsapp. So can you tell me is there any chance to ban adsense account.i am using other approved website adsense code.